The Yellowstone River Inn Cabins and sheepwagon rest 40 feet from the Yellowstone River, surrounded by old cottonwoods, perennial gardens, five acres and 500 feet of riverfront to meander or fish. Calamity Jane's offers bed, bath, kitchen and riverside porch. Annie Oakley's shoots for bedroom, bath, kitchen and riverside deck. Our sheepherders wagon presents a rustic adventure; available as second bedroom with cabin rental. 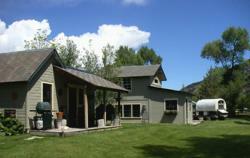 All offer spectacular river, mountain and canyon views. We are just 28 miles east of Bozeman and 49 miles north of Yellowstone National Park. The lively downtown of Livingston is just 5 miles away and the Absaroka Beartooth Wilderness within 5 minutes drive. Directions: The Yellowstone River Inn Cabins are located on the bank of the Yellowstone River at 4950 Highway 89 south, minutes from the Yellowstone Spring Creeks and the lively historical town of Livingston, the original gateway to Yellowstone National Park. Two comfy Montana cabins are 3.6 miles south of Interstate 90, Exit 333, at the mouth of Paradise Valley.